A new school year is about to start and for some of our children it will be their first. We all know how vital a good education is for our children. All in an environment of positive reinforcement. You will also be advised on healthcare, vaccination, worming, toilet training and common puppy problems like chewing, digging, mouthing and biting. We discuss canine body language and communication and play behaviour between dogs and your family members and the importance of leadership in your new family “pack”. Each pup Graduates from school with a puppy gift pack and photograph along with advice on further training options. Enrol your puppy at Warrnambool Veterinary Clinic Puppy School - it’s a fun and rewarding experience for you and your pup. 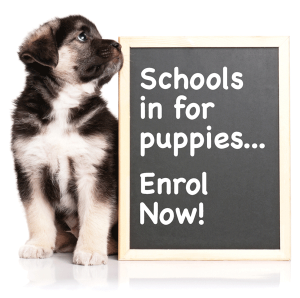 Phone Warrnambool Veterinary Clinic on 5561 2255 to enrol your puppy.